In 2010 Mariko Mori founded the charitable foundation FAOU with the stated intention of creating “a series of six site-specific art installations, spread across six unique ecological settings of the six habitable continents on earth”, each work providing “lasting testimony to the natural beauty of its surroundings.” One of those site specific works, ‘Ring’, is currently installed at the Royal Academy in ‘Rebirth’, the artist’s first solo show in London in 15 years. Another, ‘Primal Rhythm’, is there in documentary form. When it is complete ‘Primal Rhythm’ will be located in a bay off the coast of Okinawa in Japan; a Plexiglas column, ‘Sun Pillar’, emerging from a rock cluster and a large Moonstone rising out of the water shifting its colour according to the phases of the moon. At the winter solstice – this year predicted by the Mayan calendar to herald the end of the world and its rebirth – the sun pillar will cast a shadow over the water to intersect precisely with the moonstone. ‘Ring’ is a Lucite circle symbolising the eternal cycle of life. In the Royal Academy exhibition it is suspended above an artificial waterfall. How much more poetic and beautiful it will seem when it finds its intended location, floating indefinitely over a waterfall in Brazil. Man made of a synthetic material it will speak of and to a world wherein humanity is one with nature, where human rhythms coincide with those of the natural environment. 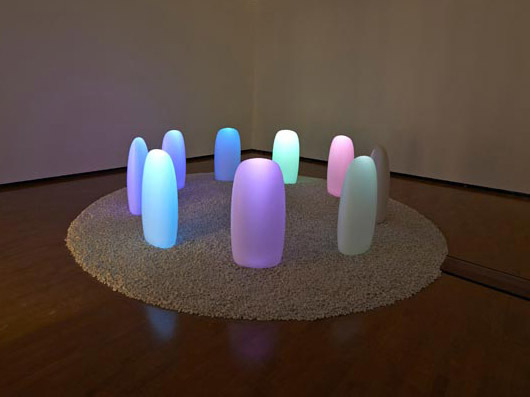 Wandering around the exhibition at the Royal Academy the viewer is faced with biomorphic shapes, with twinkly lights, with rocks and acrylic objects in Stonehenge-esque formations and drawings in pastel colours. In the texts we are confronted with words such as ‘transcendence’, ‘consciousness’ and ‘universe’. It is not easy, in the post-modern, post-internet western world to address such matters without being perceived a crackpot. Through our defensive filters of hardness and scepticism we could be wont to see all of this as nothing more than mawkishness. Or as some sort of moral imperative to ‘save the world’, a Christian style beration upon our heads for not behaving more responsibly towards the planet. The paradoxical nature of the universe seems to defy easy translation into words and images and I am reminded of the warning of the Tao Te Ching: “the Tao that can be told is not the eternal Tao”. But Mori is not a hokey space-cadet, nor is she engaged in the business of telling us what we should or shouldn’t be doing. Sitting opposite her in a quiet stately room at the Royal Academy she exudes inimitable elegance and thoughtful, intuitive grace. Born in Tokyo in 1967 she grew up in Japan. In 1989 she moved to London to study at Chelsea College of Art. She now lives and works in New York. The cultures, philosophies and theologies she is most interested in and influenced by are those native to her, those of her ancestors: Shintoism and Japanese Buddhism. She is also interested in science, cosmology and modern technology. Discussing the question of man’s relationship to nature she tells me: “We are nature. Our minds overestimate human power towards nature. There is no good and bad, just the rhythm of the world. We can’t control it.” Speaking of the difficult ecological events in Japan over the last two years she says: “It is sad to lose so many lives but at the same time we are part of a whole.” These are not the words of a mawkish sentimentalist. Not at all.